If you asked Bailey Spaulding what she wanted to be growing up, her answer would have been a lawyer. Little did she know that while attending law school she would discover a newfound love: brewing beer. Bailey graduated with a Biological Anthropology degree from Harvard University and moved to Nashville to attend law school at Vanderbilt University. In her first year of law school, Bailey started a new hobby of homebrewing. It didn’t take long for this hobby to turn into a passion. Before she knew it, she was dreaming about recipes and business plans instead of what type of lawyer she wanted to become. Throughout law school Bailey continued to practice homebrewing and creating business ideas for a brewery. After she graduated law school, the rest is history. Bailey recognized that Nashville had a need for local breweries, so she moved forward with her newfound passion, and Jackalope was born. Jackalope Brewing Company opened in May 2011. At the time of its inception, Jackalope was the first local brewery to open in eight years, and also the first woman owned brewery in the state of Tennessee. You could say that Jackalope helped set the trend for the expansive local brewery selection Nashville has today. Multiple others opened up after Jackalope in 2011: Fat Bottom, Little Harpeth, and Black Abbey– just to name a few. 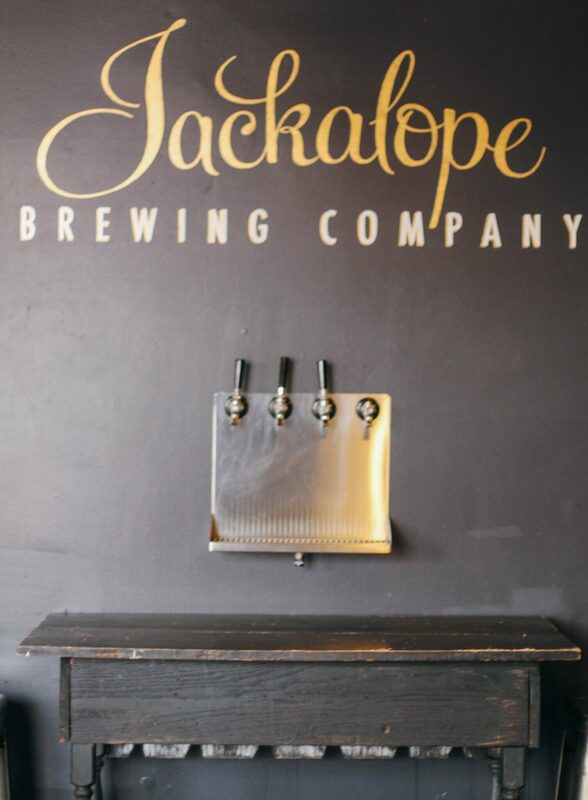 Speaking of selection, Jackalope has created over 50 beers and at any given time there are 12 different beers on tap. Customer favorites include: Bearwalker Maple Brown, Thunder Ann American Pale, Rompo Red Rye, and the Leghorn Rye IPA. Jackalope fits into the Nashville scene through its creative personality, much of which can be accredited to the cities artistic culture. “We have a mutual respect for the arts. Musicians are creating music, and we are creating beer.” Says Steve Wright. “We love the creative process.” With beers named like Spruce Beersteen Black IPA, it’s hard to say Jackalope lacks creativity. One aspect of the business that makes it so successful is the team’s chemistry. The second you start hanging out with these guys, it’s evident they really enjoy each others company. They are genuine people who love to have fun and make great beer. There’s never a dull moment when the Jackalope crew is around. A favorite pastime of theirs is to drink their beers at local bars that serve them. These moments motivate them to grow their business even more. If it weren’t for Nashville, Jackalope probably wouldn’t be where it is today. The city’s loyalty to local businesses and strong community support has allowed the company to reach unimaginable heights, and given them the confidence to push themselves even further as a business. In the future, Jackalope has their sights set on becoming a strong regional brewery. The company started at the beginning of the Nashville boom and has thrived with the city ever since. Nashville’s help doesn’t go unnoticed; Jackalope gives 20% of all their seasonal beer sales to local non-profits. They also sponsor many local beer festivals and events, and work on giving back to the community with free active classes, and philanthropic stream-cleanup with Percy Warner Parks, and invasive plant removal with The Nature Conservancy group, just to name a few. While Jackalope does not currently offer any happy hours, they host events such as trivia nights on Thursdays, live music on Sundays, and multiple parties throughout the year for beer releases. They are also open seven days a week, which ensures you can have that tasty brew, any day of the week. Be sure to visit our friends at Jackalope and tell them LivingTN said Hi!